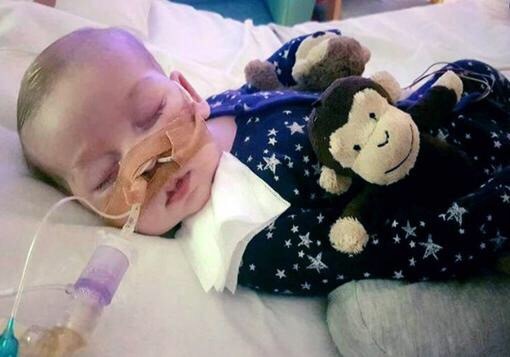 On the first of this month, I wrote about Charlie Gard, a child in the UK who after a protracted court battle was going to have his life support withdrawn against the will of his parents. Since I wrote that article there have been several developments in Charlie’s story. If we can help little #CharlieGard, as per our friends in the U.K. and the Pope, we would be delighted to do so. To defend human life, above all when it is wounded by illness, is a duty of love that God entrusts to all. The Bambino Gesù Children’s Hospital in Rome offered to take Charlie into their care, an offer rejected by the British authorities. The Vatican is reportedly exploring granting Charlie Vatican citizenship and a Vatican passport, which would potentially no longer make him fully subject to the British & European Courts. Several American hospitals have made similar offers to take Charlie into their care. Doctors in the United States offered to, pending FDA approval, ship the medication and equipment needed for the proposed experimental treatment to the UK along with a proposed treatment protocol, so Charlie could receive the treatment without being transferred. The latest development is that an American physician, Dr. Michio Hirano, has flown to the UK and been given clinical privileges at Charlie’s hospital and access to his medical records. Dr. Hirano is a New York based physician and professor of neurology at the Columbia University Medical Center. He is one of the experts who believe that Charlie would benefit from the experimental treatment. He is examining Charlie and meeting with UK Physicians today. We can only pray for good news this week. This morning another OpEd about Charlie appeared in the Wall Street Journal from columnist Bill McGurn- which serves to remind us of some of the wider issues at stake in this conflict between state-empowered physicians and two ordinary parents. “Charlie Gard’s story comes after a case in the Netherlands where elderly women suffering from dementia woke up and resisted as she was about to be euthanized—only to have the doctor order her family to hold her down for the fatal injection. Meanwhile, how many moms and dads of children with Down syndrome have had complete strangers come up to ask, “Didn’t you have a test?” Translation: Surely you wouldn’t have had this child had you known. As free citizens, recognizing the fundamental dignity of life and the sacred bond between parent and child, we must allow no government intrusion into this area of our lives. Our freedom and independence over our lives must be won daily. If it is not, the slow creep of statism will leave you fighting for your child’s life in a hospital room against physicians, experts, and lawyers. The Kids are Alright, it’s the System that’s Fucked. Humanity Faces Competition of Attention Span with….a Goldfish. Remember That Time When Supergirl Was A Racist? The Little League World Series is AWESOME. Goodbye Usain and Sir Mo. I Hope Bolt Stays Forever Faster. And You Should Too. Is This What We Want For Our Future? Tiny Bubbles… Champagne, Prosecco, and Cava, Oh My!